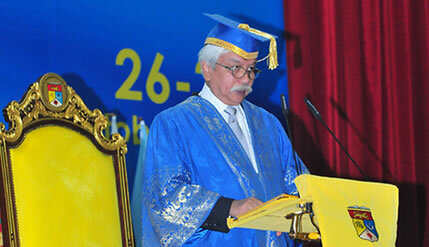 BANGI, 26 Oct 2013 – Tuanku Muhriz Ibni Al-Marhum Tuanku Munawir is proud of the ability of The National University of Malaysia (UKM) in instilling the spirit of innovation and inventions in its graduate and post-graduate students. The UKM Chancellor congratulated the university’s community and its leadership for successfully working together to uphold its good name through various successes, networking and its world-class expertise. Addressing the 41st Convocation of UKM here today, he called for its continuing efforts in its various programmes so as to face future challenges, especially at the international level. He said the efforts should be regarded as preparations to produce graduates who are able to compete with other scholars and researchers in the world. “ Thus UKM needed to come up with new methods and make news discoveries,” said the Chancellor, who is the Yang Di-Pertuan Besar of Negeri Sembilan. Such efforts are not just for the sake of university rankings carried out by international ratings agencies but is also part of the government’s objective in helping raise the living standards of the people while stepping up trade. He said the country needs citizens who are creative and innovative in industry and the high technology sector. He expressed satisfaction that the Vice-Chancellor, Profesor Tan Sri Dato’ Seri Dr Sharifah Hapsah Syed Hassan Shahabudin has led the 200 member Association of Asia-Pacific Universities since December 2012. Due to the hard work of UKM, it has been able to maintain its status as a research university for seven successive years. UKM had responded to the aspirations of the National Transformation Plan which demands research universities build a culture of innovation to contribute to economic growth and social well-being to meet its target of becoming a high-income developed country by 2020. He reminded those who graduated that they should not be satisfied with their achievements so far but should continue to strive their utmost. He also told graduates receiving their scrolls during the convocation that they should always be grateful to UKM wherever they go after this.